She was my “first born,” the first dog that was mine to raise. The timing was right–summer of 2001, we had just moved out of NYC the past February, to a small house with a nice yard in Rockland County. Getting her was an experiment–my then-husband was allergic, never had a dog but always longed for one. I looked up standard poodles because I always grew up with large dogs, and heard of their amiable dispositions. I wanted a girl dog because that was what I always had growing up at both houses: Greta, Rozzy, Brandy, and Corey. All girls. I hoped for a smaller dog because our house was tiny, and standards could grow to more than 80 pounds. 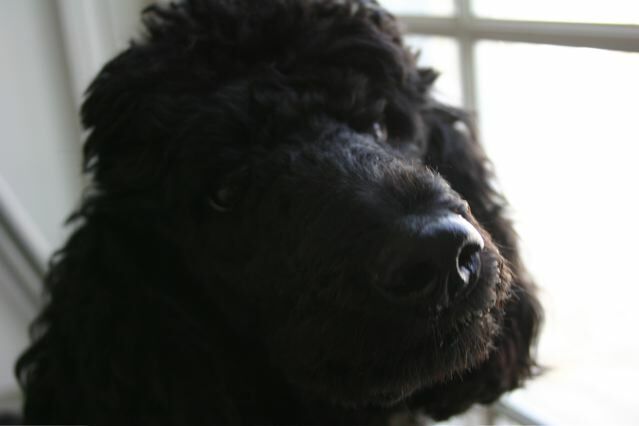 I researched and found her breeder, Jake–a Zen master in black standard poodles in Hyde Park. It seemed like fate; he had a new litter coming down from Canada in less than a month. A few were already claimed; but he thought there would be a “little girl” left for us. I went ahead with the plan because Jake understood the allergy issue, and said he’d be willing to take her back if it didn’t work out. When I told my ex, he was nervous but excited. She was the smallest of Jake’s bunch, but with a sweet, animated but not-too-feisty spirit. When we went up to meet her in late July, I brought a list of names with me. The first on the list was Nadine–a proper French girl name, I figured. She was a few feet away from us, curious. “Nadine,” I said. She came right to us. It was obvious she would be ours. We went home that day hoping it would work out. And it did, better than we could have imagined. Two years later, E came into the world. At first jealous, Nadine soon learned that having a sister was a great thing. She was protective and gentle, and proved to be an ideal dog around kids of all ages, even babies. They grew up together, Nadine was E’s big sister. When I made the decision to split with my ex, there was no question that Nadine would stay with us; we could not split up the girls. She met B on our second date, and it was love at first sight. We joked it was the French thing (he’s 1/4 French Canadian), but seeing her take to him immediately was a sign for me. She was a people person type of dog, but there were some people she really didn’t like so much, and usually there was good reason. And the people she took to immediately, there was a good reason for that, too. I thought she was an excellent judge of character, overall. She loved being active, and in her first 10 years, was a great personal trainer to me. We would enjoy jogging together on the rail trail near our old house and she joined B and me on many hikes before stamina became an issue for her. I loved seeing her run around our yard, frisbee in tow. Her favorite game was keep-away. A wonderful, fun, funny dog, like many poodles, her personality seemed so human. Now in our blended family, she became a glue to help us come together. One thing we all had in common: We all loved Nadine. It was impossible not to. Sport for us would be doing our “Nadine impression,” trying to articulate all of the wacky things she was thinking. At first, it was French-accented, but then it morphed into more of Dr. Doofenshmirtz-sounding voice. She was ever-present and an integral part of our lives. Last night I had a dream. It was just the two of us, and we were running. She was looking up at me, tail wagging, like it used to. She was with us for thirteen and a half years, longer than I thought we would have her. But it still feels too short. I will always be thankful for my first born, the beautiful, funny, wonderful Nadine.